B&M Lifestyle | B&M's BIG GIVEAWAY - ONE Chance to WIN £100 Worth of B&M Vouchers, Courtesy of Solvite! B&M's BIG GIVEAWAY - ONE Chance to WIN £100 Worth of B&M Vouchers, Courtesy of Solvite! It's always a perfect time for a competition so we've decided to give away an amazing prize in our brand new one! 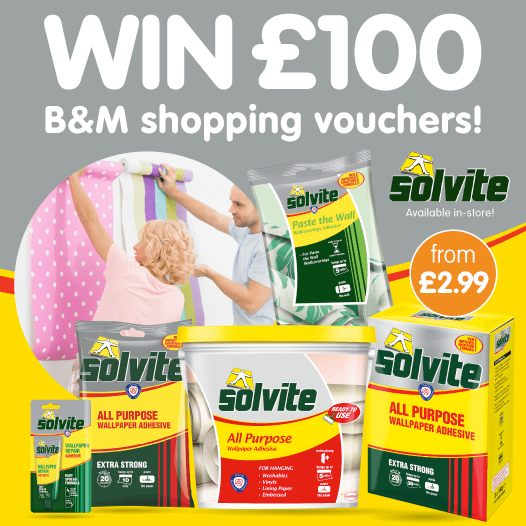 We're giving away a chance for ONE lucky winner to WIN £100 worth of B&M vouchers, thanks to Solvite! To be in with a chance of winning, you can visit the B&M Facebook page and like a competition post, retweet a competition post on our Twitter, or you can enter by visiting our competitions page. The winner will be selected at random and you have until 09:00 5th February 2019 to enter.